With a volume range between 0.5 µL and 20 µL, our new Liquidator™ Manual 96-well Pipetting System brings manual high-throughput pipetting to many low- volume applications. Its high channel-to-channel consistency delivers reliable and reproducible data. 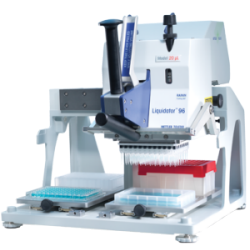 Liquidator delivers the same accuracy and precision as a single or multi-channel pipette, but in a 96-channel, high-throughput format. In fact, the 20 µL Liquidator's exceptionally high channel-to-channel consistency translates into high quality analytical data that is reliable and reproducible. Experiments like PCR and qPCR in particular benefit from this level of accuracy and consistency. By understanding the need for high-throughput liquid handling workflow in a lab, METTLER TOLEDO developed the Liquidator line to fit a unique need: scientists who require production level, high-throughput performance, but at a scale more useful and practical for research and development. For genomic, proteomic and cell-based assays, 96 and 384-well plates allow researchers to set up multiple samples in a compact format that can greatly enhance downstream assays. But despite their many benefits, working with plates can be challenging. For one, filling multiple plates using single and multi-channel pipettes can be slow and tedious and is prone to skipping or repeating wells. Conversely, automated pipetting systems have large footprints and require fairly complex programming knowledge. The Liquidator 96 is an ideal solution by streamlining 96 and 384-well plate work. Simultaneous 96-well pipetting eliminates well-to-well variability and the need to rush through an assay. Complementing the 5.0-200 µL range of the original 200 µL Liquidator 96, the new 20µL model brings considerable breadth and flexibility to the Liquidator 96 product line. Both models are supported with a complete line of high quality, precision engineered consumables and accessories, including Rainin's ultrapure 20 µL and 200 µL BioClean Liquidator tips.